"Matsuri" redirects here. For other uses, see Matsuri (disambiguation). Japanese festivals are traditional festive occasions. Some festivals have their roots in Chinese festivals centuries ago, but have undergone great changes as they mixed with local customs. Some are so different that they do not even remotely resemble the original festival despite sharing the same name and date. There are also various local festivals (e.g. Tobata Gion) that are mostly unknown outside a given prefecture. Unlike most people in East Asia, Japanese people generally do not celebrate Lunar New Year (it having been supplanted by the Western New Year's Day, on January 1, in the late 19th century); although many Chinese residents in Japan, as well as some shrines and temples for religious purposes, still celebrate Lunar New Year in parallel with the Western New Year. In Yokohama Chinatown, Japan's biggest Chinatown, tourists from all over Japan come to enjoy the festival. Similar for Nagasaki's Lantern Festival that is based in Nagasaki Chinatown. See: Japanese New Year. Festivals are often based around one event, with food stalls, entertainment, and carnival games to keep people entertained. Some are based around temples or shrines, others hanabi (fireworks), and still others around contests where the participants sport loin cloths (see: Hadaka Matsuri). Matsuri (祭) is the Japanese word for a festival or holiday. In Japan, festivals are usually sponsored by a local shrine or temple, though they can be secular. There are no specific matsuri days for all of Japan; dates vary from area to area, and even within a specific area, but festival days do tend to cluster around traditional holidays such as Setsubun or Obon. Almost every locale has at least one matsuri in late summer/early autumn, usually related to the rice harvest. One can always find in the vicinity of a matsuri booths selling souvenirs and food such as takoyaki, and games, such as Goldfish scooping. Karaoke contests, sumo matches, and other forms of entertainment are often organized in conjunction with matsuri. If the festival is next to a lake, renting a boat is also an attraction. Favorite elements of the most popular matsuri, such as the Nada no Kenka Matsuri of Himeji or the Neputa Matsuri of Hirosaki, are often broadcast on television for the entire nation to enjoy. An annual festival during which the grass on the hillside of Mount Wakakusayama is set on fire. Sapporo Snow Festival is one of the largest festivals of the year in Sapporo, held in February for one week. It began in 1950 when high school students built snow statues in Odori Park, central Sapporo. The event is now very large and commercialized. About a dozen large sculptures are built for the festival along with around 100 smaller snow and ice sculptures. Several concerts and other events are also held. Lake Shikotsu is the northernmost ice-free lake which is 363 meters deep. This festival features a moss-covered cave, which has evergreen draped on the inside and is covered in ice (Gianola, 2008). This festival is held from late January to mid February. This festival features ice sculptures, small and large. At night the sculptures are illuminated by different colored lights. There is a fireworks show during the festival as well. Admission is free. Amasake (hot sake) is available for purchase to enjoy (2008 Ministry of Land). This lake festival is held in the beginning of February. Held in the town of Yasumiya, this festival is on the south side of Lake Towada (near the wooden statues). This festival is open all day, but at 5 pm one can enjoy activities such as going through a snow maze, exploring a Japanese igloo, and eat foods from Aomori and Akita prefectures. There is a fireworks show and events held on an ice stage. 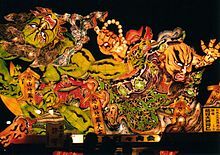 This festival is held annually and features colorful lantern floats called nebuta which are pulled through the streets of Central Aomori. This festival is held from about August 2–7 every year. This event attracts millions of visitors. During this festival, 20 large nebuta floats are paraded through the streets near Aomori JR rail station. These floats are constructed of wooden bases and metal frames. Japanese papers, called washi, are painted onto the frames. These amazing floats are finished off with the historical figures or kabuki being painted on the paper. These floats can take up to a year to complete. There is a dance portion of this festival. There are haneto dancers and they wear special costumes for this dance. Everyone is welcome to purchase their own haneto costume that they may too join in on the fun (Mishima, Aomori Nebuta Festival). This event is held every year. Thousands of artists from all over Tohoku and even further regions come to Nango to perform. This is the largest open-air jazz concert held in Tohoku region. This festival began in 1989, in a small venue indoors. There was such a large response from the fans that it was expanded into a large annual festival. One must purchase tickets for this event (Bernard, 2007). This summer jazz festival doesn't cost anything but potential members of the public still need to receive a ticket to enter the event. Matsuyama Shiroyama Koen Cherry Blossom Festival in Matsuyama-city, Ehime. This festival takes place early April. Matsue Jozan Koen Festival in Matsue-city, Shimane. This festival has a feature of illuminating the cherry blossom trees at night. This festival takes place late March-early April. Tsuyama Kakuzan Koen Cherry Blossom Festival in Tsuyama-city, Okayama. Japanese tea ceremonies and music performers are held at these festivals. This festival is held early-mid April. Takato Joshi Koen Cherry Blossom Festival in Takato-machi Ina-city, Nagano prefecture. The trees in this region have pink blossoms. This festival is held early April. Takada Koen Cherry Blossom Festival in Joetsu-city, Niigata prefecture. This festival is held early-mid April. Kitakai Tenshochi Cherry Blossom Festival in Kitakami-city, Iwate. This festival is held mid April-early May. Hirosaki Cherry Blossom Festival held in Hirosaki Koen Hirosaki-city, Aomori prefecture. This festival is held late April-early May (Mishima, Cherry Blossom Festivals 2010). Following the Japanese diaspora, many places around the world celebrate similar festivals, often called matsuri. Brazil hosts the 2nd largest nikkei population in the World and some Brazilian cities host matsuri such as São Paulo and Curitiba. The United States host the 3rd largest nikkei population in the World and some American cities host matsuri such as Los Angeles, San Jose and Phoenix. 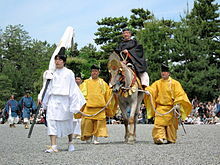 Naoi-shinji, also known as "Hadaka Matsuri (naked festival)", started in the year 767 AD, the Nara Period. This right was founded on the fact that the governor of Owari Province (presently Aichi Prefecture) visited the Owari Shosha Shrine (Konomiya shrine) to drive away evil spirits and calamities, because Emperor Shotoku ordered all the kokubun-ji* to offer invocations to dispel plagues. Information: New Year observances are the most elaborate of Japan's annual events. Before the New Year, homes are cleaned, debts are paid off, and osechi (food in lacquered trays for the New Year) is prepared or bought. Osechi foods are traditional foods which are chosen for their lucky colors, shapes, or lucky-sounding names in hopes of obtaining good luck in various areas of life during the new year. Homes are decorated and the holidays are celebrated by family gatherings, visits to temples or shrines, and formal calls on relatives and friends. The first day of the year (ganjitsu) is usually spent with members of the family. People try to stay awake and eat toshikoshisoba, noodles to be eaten at midnight. People also visit Buddhist temples and Shinto shrines. Traditionally three are visited. This is called sansha-mairi. In the Imperial Palace at dawn on the 1st, the Emperor performs the rite of shihōhai (worship of the four-quarters), in which he offers prayers for the well-being of the nation. On January 2 the public is allowed to enter the inner palace grounds; the only other day this is possible is the Emperor's birthday (December 23). On the 2nd and 3rd days acquaintances visit one another to extend greetings (nenshi) and sip otoso (a spiced rice wine). Some games played at New Year's are karuta (a card game), hanetsuki (similar to badminton), tako age (kiteflying), and komamawashi (spinning tops). These games are played to bring more luck for the year. Exchanging New Year's greeting cards (similar to Christmas Cards) is another important Japanese custom. Also special allowances are given to children, which are called otoshidama. They also decorate their entrances with kagami mochi (two mochi rice balls placed one on top of the other, with a tangerine on top), and kadomatsu (pine tree decorations). A later New Year's celebration, Koshōgatsu, literally means "Small New Year" and starts with the first full moon of the year (around January 15). The main events of Koshōgatsu are rites and practices praying for a bountiful harvest. Information: This is the day when families pray for the happiness and prosperity of their girls and to help ensure that they grow up healthy and beautiful. The celebration takes place both inside the home and at the seashore. Both parts are meant to ward off evil spirits from girls. Young girls put on their best kimonos and visit their friends' homes. Tiered platforms for hina ningyō (hina dolls; a set of dolls representing the emperor, empress, attendants, and musicians in ancient court dress) are set up in the home, and the family celebrates with a special meal of hishimochi (diamond-shaped rice cakes) and shirozake (rice malt with sake). Information: Various flower festivals are held at Shinto shrines during the month of April. Excursions and picnics for enjoying flowers, particularly cherry blossoms are also common, as well as many drinking parties often to be seen in and around auspicious parks and buildings. In some areas the peach blossom, the traditional flower of Japan (the Cherry being a symbol from the Edo period symbolising the Samurai culture), is viewed as well though this flowers earlier than the Cherry. In some places flower viewing parties are held on traditionally fixed dates. This is one of the most popular events during spring. The subject of flower viewing has long held an important place in literature, dance and the fine arts. Ikebana (flower arrangement) is also a popular part of Japanese culture and is still practiced by many people today. Some main things people do during this event are: games, folk songs, folk dance, flower displays, rides, parades, concerts, kimono shows, booths with food and other things, beauty pageant, and religious ceremonies. Families go out during weekends to see the cherry blossoms, and participate in the many festivals and activities. Information: Hanamatsuri celebrates the birth of the Buddha. On this day, all temples hold 降誕会 (Gōtan-e), 仏生会 (Busshō-e), 浴仏会 (Yokubutsu-e), 龍華会 (Ryūge-e) and 花会式 (Hana-eshiki). Japanese people pour ama-cha (a beverage prepared from a variety of hydrangea) on small Buddha statues decorated with flowers, as if bathing a newborn baby. The tradition of bathing the Buddha originated in China and was introduced to Japan where it was first held in Nara in 606. Lion dancing is also a major tradition practiced during Buddha's Birthday and has become associated with the festival in Japan. Information: It originated from a Chinese folk legend concerning two stars-the Weaver Star (Vega) and the Cowherd Star (Altair)-who were said to be lovers who could meet only once a year on the 7th night of the 7th month provided it didn't rain and flood the Milky Way. It was named Tanabata after a weaving maiden from a Japanese legend, named Orihime who was believed to make clothes for the gods. People often write wishes and romantic aspirations on long, narrow strips of colored paper and hang them on bamboo branches along with other small ornaments. Information: One traditional custom to mark the end of the Bon Festival. Small paper lanterns containing a burning flame are either set afloat to a river, lake or sea or they are let go and float away into the night. Their light is intended to guide the way for deceased family members' spirits. Usually the person who lets the lantern go will write a message on the side. Information: A Buddhist observance honoring the spirits of ancestors. Usually a "spirit altar" (shōryōdana) is set up in front of the Butsudan (buddhist altar) to welcome the ancestors' souls. A priest may be asked to come and read a sutra (tanagyō). Among the traditional preparations for the ancestors' return are the cleaning of grave sites. The welcoming fire (mukaebi) built on the 13th and the send-off fire (okuribi) built on the 15th and 16th are intended to guide the ancestor's spirits back to their permanent dwelling place. Information: The Japanese tradition of going to visit scenic areas where leaves have turned red in the Autumn. The tradition is said to have originated in the Heian era as a cultured pursuit. Information: The Japanese tradition of buying and eating Pocky sticks. Information: Three- and seven-year-old girls and five-year-old boys are taken to the local shrine to pray for their safe and healthy future. This festival started because of the belief that children of certain ages were especially prone to bad luck and hence in need of divine protection. Children are usually dressed in traditional clothing for the occasion and after visiting the shrine many people buy chitose-ame ("thousand-year candy") sold at the shrine. Information: Preparations for seeing in the new year were originally undertaken to greet the toshigami, or deity of the incoming year. These begin on December 13, when the house was given a thorough cleaning; the date is usually nearer the end of the month now. The house is then decorated in the traditional fashion: A sacred rope of straw (shimenawa) with dangling white paper strips (shide) is hung over the front door to prevent evil spirits from entering and to show the presence of the toshigami. It is also customary to place kadomatsu, an arrangement of tree sprigs, beside the entrance way. A special altar, known as toshidana ("year shelf"), is piled high with kagamimochi (flat, round rice cakes), sake (rice wine), persimmons, and other foods in honor of the toshigami. A fair is traditionally held in late December at shrines, temples or in local neighborhoods. This is in preparation for the new year holidays. Decorations and sundry goods are sold at the fair. Originally these year-end fairs provided opportunities for farmers, fisherfolk and mountain dwellers to exchange goods and buy clothes and other necessities for the coming year. Information: People do the general house cleaning (Ōsōji) to welcome coming year and not to keep having impure influences. Many people visit Buddhist temples to hear the temple bells rung 108 times at midnight (joya no kane). This is to announce the passing of the old year and the coming of the new. The reason they are rung 108 times is because of the Buddhist belief that human beings are plagued by 108 earthly desires or passions (bonnō). With each ring one desire is dispelled. It is also a custom to eat toshikoshi-soba in the hope that one's family fortunes will extend like the long noodles. ^ "Nagasaki Lantern Festival - JapanVisitor Japan Travel Guide". Japanvisitor.com. Retrieved July 30, 2018. ^ "Tanabata Matsuri 2010". Braziltravelblog.com. Retrieved July 30, 2018. ^ "Governador prestigia 'Imin Matsuri', tradicional festa da colônia japonesa". Parana-online.com.br. Retrieved January 3, 2013. ^ "Haru Matsuri comemora chegada da primavera em Curitiba – Paraná-Online – Paranaense como você". Parana-online.com.br. Retrieved January 3, 2013. ^ Tadaima! Curitiba (March 25, 2011). "Evento: Hana Matsuri 2011". Tadaima! Curitiba. Retrieved January 3, 2013. ^ Myrelle Silva (October 15, 2010). "Eventos: Seto Matsuri dias 06 e 07 de novembro" (in Portuguese). Tadaima – Cultura Japonesa. Retrieved January 24, 2012. ^ "Tanabata Workshop: A Pre-Nisei Week Celebration by Japanese American National Museum". Discovernikkei.org. Retrieved July 30, 2018. ^ "Annual Phoenix Events". Discover Phoenix Arizona. Archived from the original on September 23, 2015. Retrieved September 5, 2015. ^ "Hanamatsuri Service". Meetup.com. Retrieved July 30, 2018. ^ Hulsbosch, Marianne; Bedford, Elizabeth; Chaiklin, Martha (July 30, 2018). "Asian Material Culture". Amsterdam University Press. Retrieved July 30, 2018 – via Google Books. ^ (in Spanish) "Pocky No Hi – Día del Pocky en Japón". japonandmore.com.